We often crave the flavors of tom yum soup, but sometimes we just don’t want soup! 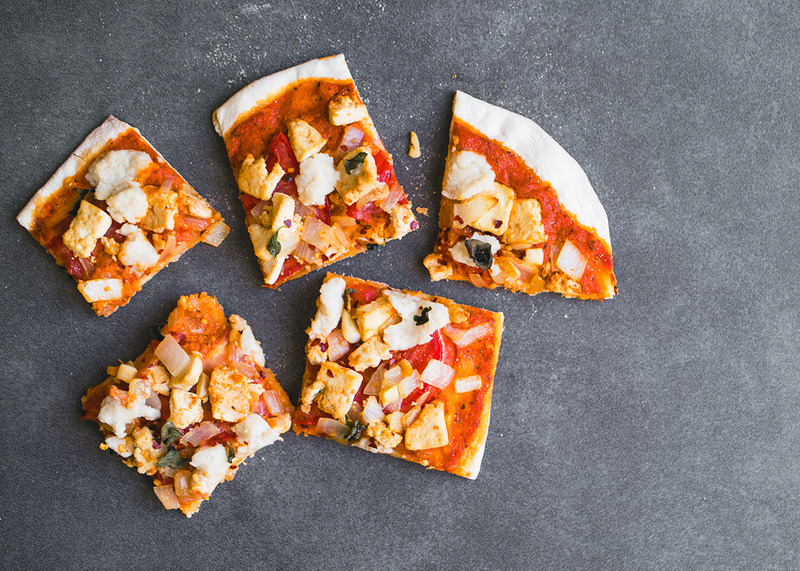 So, we decided to turn our beloved tom yum into a pizza with all of the sweet, sour and spicy Thai flavors you can handle. This recipe will require a trip to your Asian grocery store, but it’s gonna be soooo worth it! Perfect for a weekend with friends. See video walkthrough here, or full recipe details are below! Tag us on Instagram or Facebook if you make it! If you haven't made your pizza dough, make that now or set out your store-bought pizza dough to rise based on package directions. Make sure the tofu is pressed and all water has been released. If you haven't pressed it, do that now. Set aside. Heat a skillet on medium heat and once hot, add in a teaspoon of oil. Once hot, add in the garlic and chilis and cook until fragrant. Add the onions and carrots for a few minutes until the carrots become softened. Pour in the tomato sauce and turn the heat down to medium low if it's boiling too much. Add in the brown sugar, soy sauce, vegan fish sauce, vegan oyster (mushroom) sauce and coconut milk. Stir well. Add in the lemongrass (roll the lemongrass with a rolling pin first to bring out some of the juices). Remove the middle stem of the kaffir lime leaves, make small tears in the leaves and then add to the pan. Mix well. Let the sauce cook for 10-30 minutes, depending on how much you want the flavors to develop. Once the sauce is ready, take the lemongrass out. Pour the sauce into a blender and blend well until all ingredients are combined. Set aside. Heat a medium size skillet on medium and add a teaspoon of oil. Once hot, add your other onion. Once translucent, add in the tofu and mix well with the onions. Add in the garlic and the other batch of kaffir lime leaves (making sure the stems in the center of the leaves are removed, and the leaves have small tears in them to bring out the flavors). Cook until the tofu is getting golden. Add a teaspoon of soy sauce (optional for more salty flavor). Next, roll out the pizza dough. Once it's rolled out, add the blended pizza sauce to the dough so that there is a thin layer that extends to the edges. 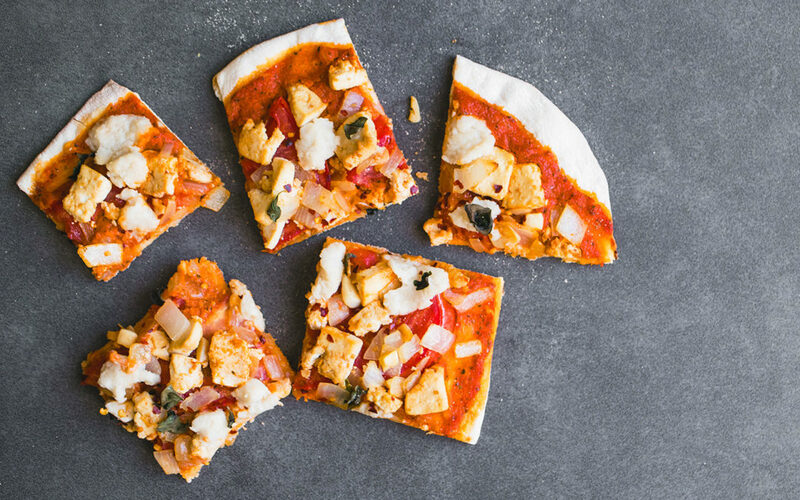 Add the tomato, tofu and onion toppings, and your optional vegan cheese and Thai basil. Cook the pizza on the grill (this takes some practice! ), or in the oven according to the instructions on your pizza dough. Once the pizza is golden and the dough is cooked through, take it off the grill or out of the oven, squeeze some fresh lime over it and enjoy!